Follow all the latest action in the 2016 NCAA tournament's Sweet 16 with Sports Illustrated's writers and editors. Stay on this page for all the latest scores, news and analysis from Thursday's Sweet 16 action. The way things left off in this NCAA tournament—with Wisconsin’s buzzer-beating three against Xavier, just after Texas A&M completed the greatest last-minute comeback in college basketball history—the roughly 90-hour break before the Sweet 16 tipped off seemed particularly long. The second round had largely bucked the first’s embrace of the underdog, but the upside to that was that the first four games of the Sweet 16 would be loaded with firepower. The top three seeds in the West and South regions, plus a No. 4 in the former and a No. 5 in the latter. It looked like we were set for another night full of high-stakes drama, even without any appearances from Cinderella. What we ended up getting was . . . not very dramatic at all. A Villanova-Miami shootout ballooned into a Wildcats blowout. Oklahoma handily dispatched the Texas A&M team that had to come from 12 points down with 44 seconds left against Northern Iowa last Sunday in what became a double-overtime win. Kansas came out of halftime scorching hot and left Maryland burned and beaten. 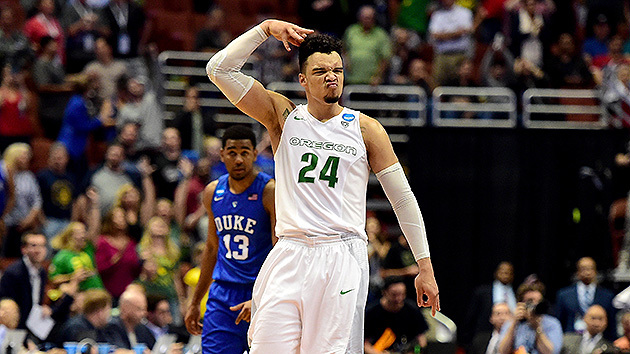 Oregon simply ran Duke out of Anaheim. As analytics guru Ken Pomeroy pointed out on Twitter, the tightest game of the night was NJIT edging UT-Arlington, 63-60, in the CIT quarterfinals to earn a date with Columbia. Which is not to say that Thursday’s games were not worth watching. They didn't go down to the wire or bust many brackets, but they may have hinted at what's to come in this tournament for each of the victorious teams. 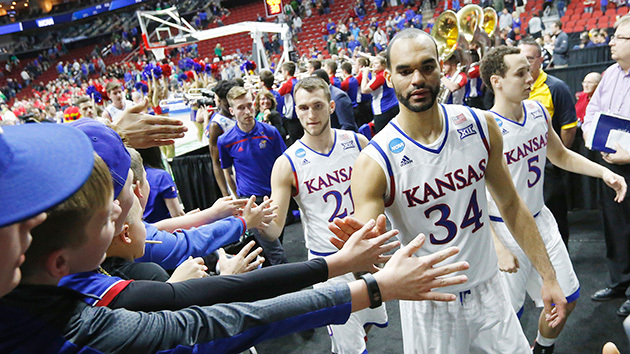 For the Jayhawks, the top seed in the South, it was the brilliance of senior forward Perry Ellis, subject of approximately 5,000 Twitter jokes about his age and purveyor of nearly as many moves in the post. The 22-year-old (really) finished with 27 points on 10-of-17 shooting, including 10 points in the game’s first 12 minutes. He and junior frontcourt mate Landen Lucas (14 points, 11 rebounds) dominated the interior, while Terrapins uber-freshman Diamond Stone put up just five points, with four rebounds, and four fouls. The game was close for a little while, but Kansas made six straight field goals to open the second half, quickly extending what had been a two-point halftime lead to seven. Maryland never seriously threatened after that. The biggest remaining moment of uncertainty came when the officials reviewed a replay of Frank Mason’s layup as time expired, which would determine whether Kansas won by 14 or 16. Fittingly, it counted. Oregon also ended its win on a why-not high note, when sophomore Dillon Brooks chucked up an NBA-range three-pointer as the shot clock expired with 10 seconds left in the game. When it went in, pushing the Ducks’ margin to 14, all TBS play-by-play man Verne Lundquist could manage was a sigh. (According to a tweet from SI's Pete Thamel, Brooks said Duke coach Mike Krzyzewski told him in the handshake line that he's "too good of a player to be showing off like that." In the postgame press conference Krzyzewski said, "I didn't say that . . . I said 'You're a great player.'") Brooks made four of his nine threes and the team shot 43.5% from deep, but more importantly the Ducks showcased the length and explosiveness that made them the Pac-12 regular season and tournament champs and a threat to win the school’s first national title since FDR’s second term in the White House. They locked up in their zone press. They pushed the ball up the floor. They threw down dunks. The NCAA tournament’s first-ever champion knocked out the defending one by playing like the perennial Final Four threat it has not been. Things got so backward that Grayson Allen actually got tripped, albeit incidentally. The No. 2 seeds made statements of their own. For Villanova, it was the continuation of its first-weekend proclamation: These are not the same Wildcats that have made a recent habit of early exits. The Wildcats beat the Hurricanes by 23, and it was only five points away from being their smallest margin of victory in this tournament. Yes, Villanova can be reliant on threes, but as it showed against Miami, it can also bury you with them. Ryan Arcidiacono and Kris Jenkins each had 21 points and combined to make nine of 16 triples. The Wildcats’ team stats were even more eye-popping: they shot 62.7% from the field, 66.7% from three, and 94.7% from the free-throw line, averaging an astounding 1.6 points per possession. (They also thoroughly dominated the glass, rebounding nine of their 19 misses.) Or maybe it’s the Hurricanes’ stat line that is more telling: they shot 53.2% from the field and 58.8% from three . . . and got manhandled. As concerning as that is for Villanova’s defense, it’s also proof of how dangerous its scorers can be once they get rolling. Oklahoma, meanwhile, showed once again that it has more to it than just its irrepressible star guard. Texas A&M keyed on Buddy Hield from the start, and the result was that even though the Wooden Award co-favorite was held to 17 points, eight below his average, four other Sooners ended up scoring in double figures. Junior Jordan Woodard had 22 points, making five of six threes. Forwards Ryan Spangler and Khadeem Lattin each had 10. And of course, Hield still added 10 rebounds, for his first double double of the season. He may be contained, but he won’t be stopped. Perhaps no play better exemplified the Aggies’ losing game of whack-a-mole than one in the final minute of the first half, when Hield was trapped by two defenders in the corner. He dumped the ball to Spangler, who clanked a jumper off the backboard, missing iron. But Woodard, without a defender near him, corralled the ball and touched off a floater as the shot clock hit zero. It fell, and the Sooners led by 19 going into halftime. It was that kind of night for all of the favorites. None of them could do much wrong. Which is why Thursday’s chalk portends so well for Saturday’s heavyweight double main event. The banging and balanced Jayhawks will face the lights-out Wildcats in the South. Oregon’s wings will run into Hield and his buddies in the West. It’s two No. 1s against two No. 2s. Surely, one would think, it will be must-see TV. LOUISVILLE — Kansas had been a part of this situation before, more times than it wished to remember: a team with NBA-level talent, which began the season ranked in the top 10, falls flat in the NCAA tournament against an opponent with no sure-fire first-round picks in its starting lineup. It happened to the Jayhawks in 2010, when their six future NBA players were upset in the second round by Northern Iowa. It happened to KU in 2011, when its six future NBA players were upset in the Elite Eight by VCU. Happened again in 2014, when Andrew Wiggins was knocked out in the second round by Stanford. Happened again in 2015, when the Kelly Oubre Jr. team was sent home by Wichita State in the Round of 32. And it happened again on Thursday in the Sweet 16—except Kansas, despite being a No. 1 seed, was on the other side of the situation. It was Maryland, the preseason No. 3 team in the AP poll, with projected first-rounder Diamond Stone at center, and projected (for the early part of this season, at least) first-rounder Melo Trimble at point guard, falling flat against a team without a starter that NBA scouts covet. 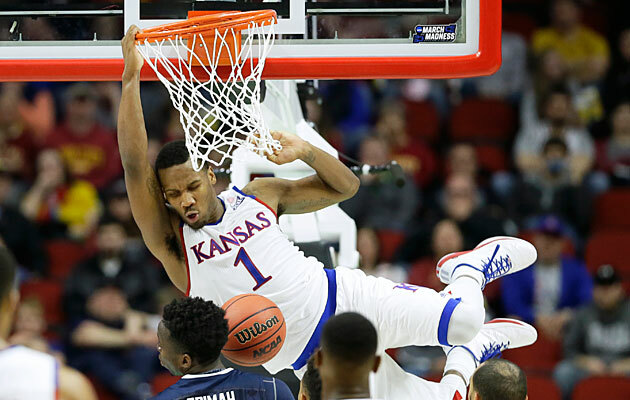 Kansas, which won 79–63 and moved on to face Villanova in the Elite Eight, remains the tournament favorite because it’s greater than the sum of its parts—and also, because one of its parts, while he’s not even guaranteed to be a second-round pick in June’s draft, could go down as one of the most valuable power forwards in the history of a storied program. Ellis won’t say these things himself, though. Faced with a question, in the post-Maryland press conference, about the meaning of his final NCAA tournament hurrah, all he said was: “Just happy with the team. Just going to try to keep competing and having fun with it.” And when he scored his final bucket on Thursday, on a pretty, face-up jumper over Dodd with 6:03 left that put Kansas up 66–53, and forced the Terrapins to call a damage-control timeout, Ellis did not yell or chest-bump or gesticulate on his way back to the Jayhawks’ huddle. All he did to celebrate the 26th and 27th points in the best NCAA tournament performance of his career, on a day where he also passed Paul Pierce on KU’s all-time scoring list, was clap—twice. The Terrapins never found a good answer. Cekovsky​ fouled Ellis again less than a minute later on an and-one, and those points plus an Ellis jumper on the ensuing possession gave Kansas an 11-point lead at 59–48 with 11:13 left. With the end of his college career on the line at every step of this NCAA tournament, Ellis has reached that peak level. He may not yet be a lock to get drafted, but he’s now one win away from the Final Four that eluded him in his first three years in Lawrence, and three wins away from being a Kansas hero. Can Villanova—or anyone—find a way to stop him? ANAHEIM, Calif. — The bench danced in its white “Mighty Oregon” warm-up jerseys. The mascot stomped its webbed feet. Inside the home arena of the NHL’s Anaheim Ducks, college basketball’s Increasingly Mighty Ducks kept coming. They kept rebounding, kept scoring, kept treating Duke the way that Duke treats most teams in most seasons—as an inferior opponent. Is Oregon good enough now? Good enough to make the Final Four? Good enough to win it? Did the Ducks 82–68 dismantling of Duke at the Honda Center late Thursday finally fill the neon yellow bandwagon? Probably not, and that is fine. That is normal for the football powerhouse with the sneaky-good hoops team. That sentiment—that Oregon never seems quite good enough, no matter how many games it wins—is emblematic of the Ducks’ season. They are the team that many consider good but few seem to consider great. Perhaps that’s unfair. No matter. The Ducks captured the Pac-12 regular-season crown, won the conference tournament and dispatched three teams in the Big Dance with relative ease. On Thursday, the Ducks didn’t just beat the Blue Devils. They overpowered and overwhelmed them and sent their own coach, Dana Altman, to the Elite Eight for the first time. Oregon plays Oklahoma here on Saturday, hoping to advance to the Final Four for the first time in 77 years. “They’re one step away from utopia,” said Mike Krzyzewski, the Duke coach. Altman tried to convey the same idea. He really did—and he really failed. His face betrayed not even a hint of emotion. His expression was as stoic as his voice was monotone. “The team’s excited,” he said, sounding not even a little bit excited. “I’m excited,” he said, sounding whatever the opposite of excited is. “We’re very excited for the opportunity,” he said. At that, you’ll have to take him at his word. The Ducks (31–6) took a six-point lead into halftime, behind nine points from reserve forward Jordan Bell. They opened the second half with back-to-back three-pointers from sophomore guard Casey Benson. This was also emblematic of the Ducks’ season, in that they hurt Duke (25–11) in different and sometimes unexpected ways. Where the Blue Devils, like most college basketball teams, rely on star players like freshman forward Brandon Ingram and sophomore guard Grayson Allen, Oregon needs all seven of the players in its rotation. Sometimes, it’s first-team All-Pac-12 honorees like sophomore forward Dillon Brooks and senior forward Elgin Cook. Other times it’s Benson, the Boy Scout doppelganger. Or Bell, the inside force. Or Chris Boucher. Or Tyler Dorsey. “They were an old, extremely well-coached team,” Krzyzewski said. “Great athletes playing together. They knocked us back. They were always in control. Right at the end, I thought we could do a Texas A&M thing. But …” He trailed off. There were no miracle comebacks on Thursday. To those who have not paid attention, and those who refused to believe, Oregon reinforced its strength on Thursday. Brooks led the Ducks in scoring with 22 points, but five Ducks reached double figures. Six Ducks played at least 18 minutes. Three Ducks grabbed at least five rebounds. That’s Oregon, a team so balanced it’s like an accountant fills out the box score. Oregon seems immune to pressure. It entered the second week of the NCAAs as the Pac-12’s final remaining team. Five conference counterparts fell in their first games of the tournament. Utah lost in the second round. Only Oregon made it through to the regional semifinals, and once there, all Wednesday its players were asked to explain how a conference that ranked among the toughest in the country stumbled so quickly and all at once. For Duke, Thursday marked the end of an unusually trying season. The Blue Devils won the NCAA title last April, behind a trio of NBA draft picks (Jahlil Okafor, Justise Winslow and Tyus Jones) and another player, Quinn Cook, who landed in the D-League. The talent drain, coupled with injuries throughout this season, left Duke more vulnerable than in most seasons. The Blue Devils lost four of their final seven games, before righting their season at the last possible moment in the tournament. Oklahoma waits for the Ducks on Saturday, and the Sooners, with their big-time backcourt and star Buddy Hield, seem tailored to give Oregon problems. The Ducks have struggled against elite guards this season, and now a team with elite guards stands between them and their first Final Four since 1939. He was excited. Really. He promised. LOUISVILLE — A gradual indoctrination into Villanova fandom took place early in Ryan Arcidiacono’s life, and it’s easy to see why. Growing up in Langhorne, Pa., a suburb of Bucks County situated a half-hour northeast of Philadelphia, Arcidiacono is the third youngest of six children to Patti and Joe Arcidiacono, two fervent Villanova supporters. Both parents attended the university, with Joe having played offensive line on the Wildcats’ football team from 1976 to ’80. Most early Villanova-flavored memories remain etched in Arcidiacono’s mind, the bulk of which took place in front of a TV screen. “I always watched the Elite Eight teams, the Sweet 16—the Final Four [in 2009], of course,” Arcidiacono said. In January 2005, a 10-year-old Arcidiacono even braved a massive snowstorm to watch his Wildcats take on an undefeated and No. 2-ranked Kansas in person in Philadelphia. The risk was worth it: Unranked Villanova stunned the Jayhawks, 83–62. Arcidiacono long fantasized about suiting up for the Villanova program he so passionately followed. That dream, now realized, has perhaps never felt more real than it did on Thursday night, when he helped author his own chapter in Wildcats history. Arcidiacono, a senior guard, and his No. 2-ranked roster ripped through No. 3 Miami, 92–69, in one of the most complete performances of the NCAA tournament. As a result, the Wildcats head into the Elite Eight for the first time since 2009, a welcome sight for a power program longing for another deep run into March. Arcidiacono, playing in his final NCAA tournament, wants to keep that run alive for as long as possible. “I’ve always dreamed of something like this,” he said. On Thursday, the guard played like a senior unwilling to end his college career, spearheading Villanova’s remarkable performance. The Wildcats shot a season-high 66.7% (10 of 15) on three-pointers and scored 18 points off 12 Hurricane turnovers. 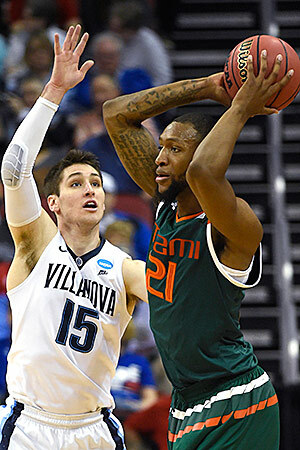 They led by as many as 15 points in the first half alone, and even though Miami managed to chisel the lead to one, Villanova entered the break leading 43–37. Its 43 points were the most given up by Miami in a first half this season. Arcidiacono chipped in 13 of them. Behind Arcidiacono, Villanova poured on the offense in the second half. It led by as many as 25 points and finished a remarkable 18 of 19 from the foul line. The senior guard hit four of his seven three-point attempts and finished with 21 points along with four assists. “When you have guys that are making shots like Ryan, and defending like Ryan, and just doing everything he’s doing as a senior, it really makes things easier on the rest of us,” said junior forward Darryl Reynolds, who finished with eight points and five rebounds. Villanova’s well-documented futility in March weighed heavily on Arcidiacono’s mind as his team entered March. The Wildcats had not advanced past the second round of the NCAA tournament in any of his first three seasons. The program’s last two tourney losses probably stung the worst: In 2014, No. 7 Connecticut (the eventual national champion) upset No. 2 Villanova in the Round of 32. A year later, a top-ranked Wildcats squad suffered an unceremonious defeat at the hands of No. 8 NC State in the second round. Fair or not, postseason failure has come to define the most recent years of Wright’s lengthy tenure at Villanova, which had failed to capitalize on high-seeded opportunities. A chance to reverse the Wildcats’ tournament fortune and finally taste the Sweet 16 at the close of his college career had fueled Arcidiacono’s final trip to the Big Dance. “Those last couple of early exits,” he said, “weren’t the best thing for our program.” Now, few would question Villanova’s bona fides after a trio of convincing victories in the tournament. It’s won its last three games by an average of 24 points, and it’s done so with balance. On Thursday, four Wildcats scored in double-figures for the 22nd time this season, indicative of a well-rounded squad that appears near-unstoppable when playing to its potential. 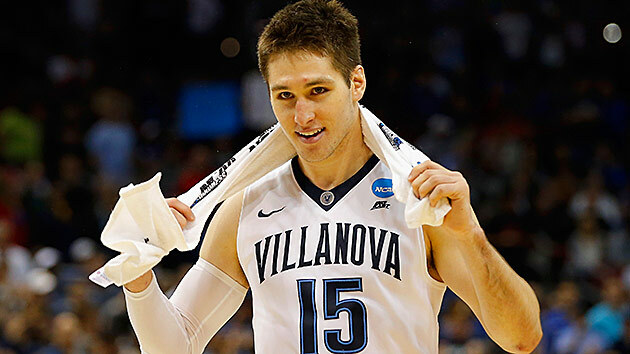 Arcidiacono has evolved into Mr. Villanova. The senior has now appeared in 141 career games for the Wildcats, more than any other player in program history. But even amid the pomp and circumstance of Villanova’s first Sweet 16 victory in seven seasons, Arcidiacono couldn’t help but inject reality into the moment. Villanova's ride isn’t over yet. Arcidiacono’s latest dream is to keep it rolling. Get all of Pete Thamel’s columns as soon as they’re published. Download the new Sports Illustrated app (iOS or Android) and personalize your experience by following your favorite teams and SI writers. ANAHEIM — Buddy Hield grew up shooting at makeshift baskets made of milk crates and contorted bicycle rims. He woke up early each morning, tip-toed through his bedroom so that he did not wake up the six siblings who slept there and played all day on a dirt court, coming home at night smothered in soot. His neighborhood in the Bahamas, Eight Mile Rock, even sounds gritty. Born with a flop of curly hair that reminded a family friend of the immortal Bud Bundy character from Married with Children, Chavano Hield soon became known Buddy. With an incandescent smile and bushel of raw talent, Buddy Hield quickly became Buddy Love during his four-year career at Oklahoma. After leading the No. 2 Sooners to a 77–63 flogging of No. 3 Texas A&M in the West regional semifinal on Thursday, Hield now finds himself 40 minutes away from the Final Four. The Sooners will play No. 1 Oregon, which ran away from No. 4 Duke on Thursday, on Saturday at the Honda Center, the game marking a culmination of a throwback career that can complete a sweeping arc. Hield sniped, darted and smiled his way to another dominant performance on Thursday night, powering Oklahoma with 17 points and a season-high 10 rebounds for his first double double of the year. He drained three-pointers, cut hard backdoor and emanated his infectious energy. The Sooners smacked the star-kissed Aggies, who only advanced after the largest last-minute comeback in college basketball history against Northern Iowa in the Round of 32. Their charmed run ended in a whirl of crimson, as Sooners junior guard Jordan Woodard led the way with 22 points. But the night provided another showcase of the resplendent talents of Hield, who drew the defense, spaced the floor and allowed the Sooners to operate unencumbered. But it all begins with Hield, the modern throwback. He’s a nod to development over entitlement and maturation over coronation. He came to Oklahoma as a hyper-athletic role player and stayed four years. As a freshman, he averaged 7.8 points per game and shot less than 24.8% from the three-point line. As a senior, he’s scoring 25.4 points per game and shooting 46.3% from three. Along the way, he gradually expanded his game from a gliding athlete and deep shooter to a cagey NBA-ready player with a polished mid-range game. His ego failed to rise with his stardom, as he’s remained the happy and humble player who arrived in Norman in 2012. It’s difficult for a college basketball star to transcend into the mainstream sports landscape these days. The rise of the college football regular season and one-and-done culture have adversely affected college basketball’s regular season. Players often emerge one season and are gone the next, and the cycle of essentially rooting for laundry, like the old Jerry Seinfeld joke, continues. The familiar four-year college star has become a unicorn, as it takes a confluence of talent and limitations, patience and dedication, to keep a player around long enough for him to ingrain himself in the national consciousness. That’s where Hield finds himself this weekend, the superstar yearning for the biggest stage. Hield could have left for the NBA early last year, as he projected as a mid-to-late first-round pick. Now the 6'4" Hield projects as a top-10 pick. One NBA scout told SI.com on Thursday that Hield’s strengths include shooting the ball from distance, scoring while playing fast and setting his feet in a hurry. Another complimented his release and motor. 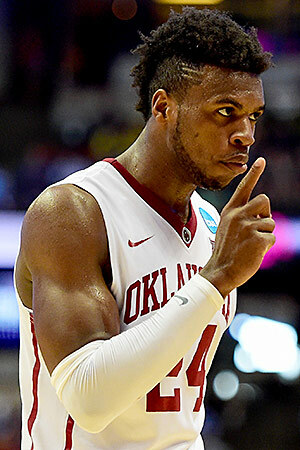 Hield’s stock will only rise if OU reaches the Final Four. Buddy’s pals aren’t so bad either, as Thursday night showcased. Ryan Spangler, a burly 6'8" senior forward, runs the floor as if being chased by hungry dogs. Isaiah Cousins, a 6'4" senior point guard is equal parts smooth operator and effective instigator. Woodard took his star turn on 5-of-6 three-point shooting. Together, they join Hield to comprise OU’s so-called Core Four, which has started 103 consecutive games. There was plenty of energy in the Oklahoma locker room on Thursday night. 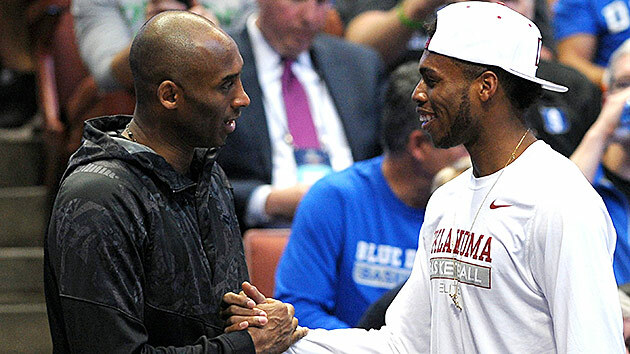 As Hield finished his interviews, the Sooners sang in unison the lyrics to “1Night” by Lil Yachty and talked giddily about the chance to meet Kobe Bryant. True to his infectious nature, Hield was more excited about meeting Bryant, who was in the Honda Center to see Team USA coach Mike Krzyzewski. Hield and Bryant later chatted and shook hands. At this rate, it wouldn’t be surprising to see the Sooners play for the national title next Monday night. It would mark the culmination of a long journey from the most humble of beginnings, an arc to stardom as endearing as it has been uncommon. No. 1 Kansas and No. 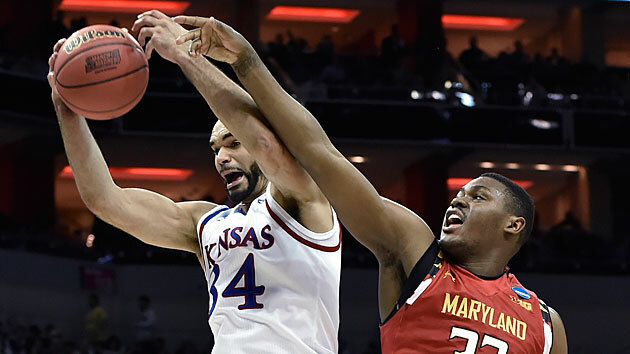 5 Maryland were deadlocked in the first half on Thursday as each team played like the heavyweights they’re capable of being, but the Jayhawks had the final word in a 79–63 victory to earn their trip to the Elite Eight and 17th straight win. They crashed the boards with authority, to the tune of a 42–26 rebounding advantage, while clamping down defensively and finding their veterans on offense. Maryland’s backcourt duo of Melo Trimble and Rasheed Sulaimon carried the scoring load. The pair accounted for 35 of Maryland’s 63 points, but Maryland was just 5 of 25 from three-point range. The Terrapins also dealt with extensive foul trouble as two starters had four fouls and four players had three. Kansas nearly met its match in the Sweet 16 against Maryland, which boasts a taller and equally talented starting lineup than the Jayhawks. But Kansas dominated on the boards, rode Perry Ellis and Wayne Selden Jr. offensively and got the Terrapins in foul trouble. Maryland’s season ends without ever realizing its full potential. Its starting lineup includes five pro prospects, but three of them are newcomers. While it might make sense on paper to put five physically gifted and individually talented players on the floor together, the talent of the group does not always equal the sum of the parts. There’s a chance the Terrapins will have to replace all five starters next season. Maryland had an NCAA tournament-best 67% shooting percentage on two-point field goals, but the Terrapins’ struggles from deep came back to bite them. They survived a 1-of-18 showing from three-point range in the second round against Hawaii, but the Terrapins’ 5-of-25 effort cost them against Kansas. The loss also means that Maryland coach Mark Turgeon fell against his alma mater, Kansas, where he played point guard and began his coaching career as an assistant. • WINN: Sweet 16 Power Rankings: Which team is most likely to win it all? No. 2 Villanova awaits Kansas in the regional final after scoring at an incredible clip of 1.58 points per possession in a 92–69 win against No. 3 Miami. The Wildcats are trying to make their first Final Four since 2009, while Kansas is in the midst of its furthest tournament run since losing to Kentucky in the national championship game in 2012. Three teams in the country rank in the top 10 in offensive and defensive efficiency and two of them will play in the South regional final. In a year full of upsets, the region’s top-two seeded teams survived their first three games and will play on Saturday for the chance to advance to the Final Four. With 12:01 left in the first half, Texas A&M freshman forward D.J. Hogg hit a three-pointer to put the No. 3 Aggies ahead of No. 2 Oklahoma, 18–15. It would be their last lead of the game. The Sooners closed the first half on a 30–8 run and never let their lead sag into single digits in the second half. Star senior guard Buddy Hield was predictably brilliant, finishing with 17 points and 10 rebounds, showing off his range and versatility by recording his first double double of the season. He had a lot of help from fellow seniors Jordan Woodard (22 points) and Ryan Spangler (10), as well as from sophomore forward Khadeem Lattin (10). The Sooners shot 44% from the three-point line and 49.2% from the floor, far outpacing the Aggies’ respective marks of 21.4% and 34.4%, and Oklahoma cruised to a 77–63 win. After its miraculous, 12-points-in-34 seconds comeback against Northern Iowa in the Round of 32, Texas A&M didn’t seem to have a full tank to take on Oklahoma. Still, the Aggies’ appearance in the Sweet 16 is a testament to the rebuilding job that coach Billy Kennedy has done in a short span with the program. With another strong recruiting class coming in for 2016, expect the Aggies to be back in contention in the SEC again next season. On the other side, Oklahoma showed a level of balance that should strike fear into its future opponents. Hield was among five scorers who finished with double-digit point totals. But the most impressive thing about the win was how stout defensively the Sooners were. Oklahoma is No. 18 in adjusted defensive efficiency, but it doesn’t always get credit or recognition for its play on that end of the floor. That should change some after holding Texas A&M to such low percentages shooting. For Lon Kruger, who is one of two coaches (Tubby Smith is the other) to take five teams to the NCAA tournament, it’s his first appearance in the Elite Eight since he took Florida to the Gators’ first-ever Final Four in 1994. Oklahoma faces the winner of Thursday night’s game between No. 1 Oregon and No. 4 Duke in the West regional final in Anaheim on Saturday night. The winner of that one will head to the Final Four in Houston. No. 2 Villanova jumped out to an 8–0 lead and never looked back, blowing away No. 3 Miami 92–69 on Thursday to advance to the Elite Eight of the South regional. A Kris Jenkins three-pointer pushed the lead to 29–14 before Miami answered with four straight threes of its own that kickstarted a 16–2 run. That closed the gap to one, but the Wildcats responded to lead by six at halftime. Villanova’s lead went back over double digits for good on a three-pointer by Ryan Arcidiacono with 14:12 left, making the score 56–44, and the Wildcats poured it on from there, at one point leading by as much as 25 in the final minutes. Arcidiacono and Jenkins each had 21 points to lead the Wildcats. Sheldon McClellan had 26 for Miami. Miami shot 53.2% from the floor, including 58.8% from three, and was never really in the game, a testament to Villanova’s overpowering offensive performance that is starting to be reminiscent of the 1985 title game, when the Wildcats upset heavily favored Georgetown by making 79% from the field. For the third straight game, the Wildcats put forth a blistering shooting performance, shooting 62.7% and 66.7% (10 of 15) from 3, as well as 94.7% from the free-throw line. Villanova entered the Sweet 16 leading all tournament teams in field-goal percentage and ranking second in three-point percentage, and it did nothing to hurt those figures. Through three games, the Wildcats are now shooting 59.9% from the field overall, 53.2% from behind the arc and 80.9% at the free-throw line.​​ If the Wildcats shoot like that, they stand an excellent chance of not only reaching the Final Four but winning the program’s second national championship. Villanova will face the winner of Thursday’s late game between No. 1 seed Kansas and No. 5 seed Maryland on Saturday at the KFC Yum! Center in Louisville. Last weekend was potentially the most thrilling ofirst- and second-round action in NCAA tournament history, but the second weekend is when the Big Dance is typically its very best. We wouldn’t have madness without upsets, but we get the best matchups of the tournament from the Sweet 16 through the championship game. Just look at Thursday’s slate, which features no team seeded lower than fifth, the No. 1 overall seed (Kansas) and the regular season champions from the Big 12 (the Jayhawks), Big East (Villanova) and Pac-12 (Oregon), plus the defending national champions (Duke) and the likely national player of the year (Oklahoma's Buddy Hield). Get ready for another thrilling weekend. These teams are near mirror images of one another. They both play at a slow pace, with Villanova ranking 257th in the country in tempo, according to kenpom.com, and Miami at 276th. The Hurricanes start three seniors and two juniors, while the Wildcats have three upper classmen in their starting five. Miami is great inside the arc and at the free throw line; Villanova is elite at both. The difference could come at the three-point line, where the Hurricanes, at 36.9%, are slightly better than the Wildcats (35.1%) from three-point range and do so on about seven fewer attempts per game. Expect a close game. The Sooners may be the No. 2 seed in the West, but they’ve been seen as the favorite to come out of this region since Selection Sunday, and despite getting closer than expected games against Cal State-Bakersfield and VCU, that is still the general consensus. The Aggies, meanwhile, had to pull off the biggest comeback in the history of college basketball just to get here. They erased a 12-point deficit in the final 44 seconds of regulation against Northern Iowa in the second round and then won in double overtime. Still, here they are, with the task of slowing down Buddy Hield to get to the Elite Eight. Can A&M's defense, ranked 12th by adjusted efficiency, contain Oklahoma from behind the arc? The answer to that question could decide the outcome. Maryland, which is 6.5-point underdogs against Kansas, has not won a game this season in which it wasn’t favored. That’s bad news when you’re playing the No. 1 overall seed in the tournament. The Terrapins certainly have the individual talent in point guard Melo Trimble, shooting guard Rasheed Sulaimon and center Diamond Stone to hang with the Jayhawks, but that hasn’t helped them against top-tier competition all season. Kansas, which is now going on two months since its last loss, is incredibly balanced on both ends of the floor, with stars in Wayne Selden on the wing and Perry Ellis down low, and it will present Maryland arguably its toughest defensive challenge of the season. Thursday night wraps up with what should be an electrifying offensive show between the Ducks and the Blue Devils. Neither of these teams is all that interested in playing defense, while both are among the top-11 teams in the country in adjusted offensive efficiency. Duke has the two best players in the game in Brandon Ingram and Grayson Allen, but Oregon can absolutely abuse the Blue Devils on their defensive glass, and they’re not exactly hurting for individual talent with forwards Dillon Brooks and Elgin Cook and freshman guard Tyler Dorsey in the lineup. The team that is able to get stops in the last few minutes of the game will likely march on to the Elite Eight.